Binoculars dangling from her shoulder, sports shoes on her feet and a backpack slung over her traditional salwar kameez, Pushpa walked uphill with the ease of a mountain woman as I huffed and puffed along. But unlike most mountain women in India, she makes part of her living from her love for walking – as a female hiking guide in Sarmoli, a picturesque mountain village in the Munsiyari district of Uttarakhand. Taking a break on our hike. We began that morning by hitching a ride on an army jeep, and were now walking along the mountain ridges of Thamari Kund, like eagles swooping over tiny villages dotting the deep valley below, layers of snow-capped mountains stretched out before us. By the time we left the blossoming rhododendron and old teak forests, and made tea on a quiet hill, we were deep in conversation about the state of the mountains and our own lives. Much like long lost friends. To tell you the truth, I couldn’t believe such a place exists in India. I was soaking up spring in New York after an adventurous month in the Ecuadorian Andes, and plotting my return to India. My heart craved the Himalayas and the warmth of its village folk, and I felt ready to finally make the 11-hour journey from Kathgodam to Munsiyari in Kumaon. Having heard about Malika, an avid mountaineer, and her work in setting up the Sarmoli village homestays, I called her to see if I could linger a while in those mountains. That’s when she first told me about their annual summer ritual – the weeklong Himal Kalasutra festival where the locals of Sarmoli come together to run a marathon with an altitude gain of 8000 feet over 20km (gulp!) and go birdwatching. That year, 2016, would include a week of meditative yoga and an introductory digital workshop by Wikipedia. The festival was geared towards the locals, but travellers (and I) were more than welcome to join. Life or something like it, in Sarmoli. 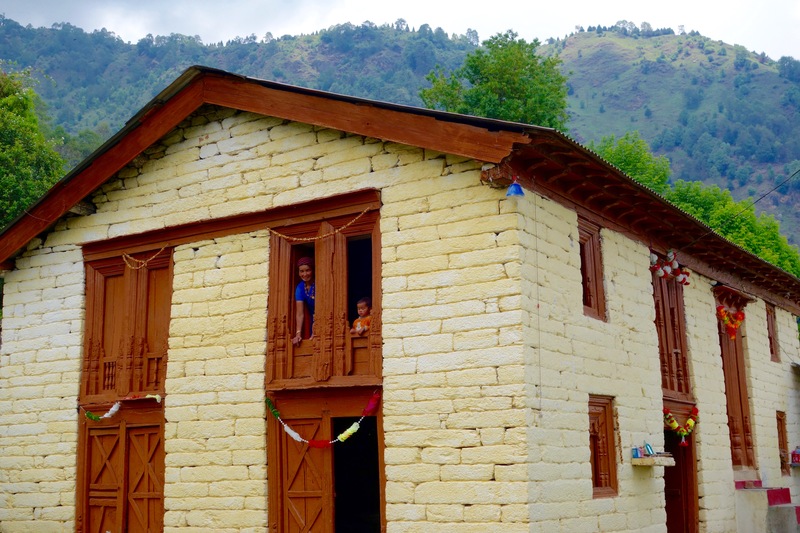 Now, I’ve spent my fair share of time in little Kumaoni villages and witnessed the hardships borne by locals. Collecting firewood, walking long distances to go to school or the nearest health center, social issues. Where is there time to train for a marathon, or look for endemic birds, or wrap their head around Wikipedia? My time in Sarmoli toppled my notion of India’s rural-urban divide. In the last few years, I had made my peace with the idea that most traditional ways of life in rural Indian communities will die out with the younger generations – and we can’t begrudge them that, for each of us seek “modern” comforts and easier lives, and it’s only fair that they should too. But Malika – and Theo and Ram – who now call Sarmoli home, have a simple philosophy: Share valuable ideas of the urban world with the locals – the importance of fitness, flavors from international cuisines, and slowly, the online world. At the same time, encourage them to keep the wisdom of the traditional world – preserve their mountain spring water sources, be proud of their language, retain their innate hospitality towards outsiders. It’s okay if the youngsters in the village want to move away for work, but they shouldn’t have to leave out of desperation or boredom. And I witnessed that philosophy in action everyday. I sat in on meetings of the Sarmoli women’s sangathan (self help group), as they discussed everything from the summer festival logistics, to helping more village women set up homestays, to their personal marathon goals (for the routes they were to run are everyday work routes in these parts). I joined them to experiment with planting tomatoes, brinjals and bhang seeds in an innovative new polyhouse. I followed them to the local magistrate’s office to revolt against a state trekking initiative that threatened their spring water sources – and saw them achieve success in getting the trekking group to camp at an alternate location and promise to carry their non-disposable waste back. I heard (and witnessed) heartbreaking stories of domestic violence faced by women from the region, and how the sangathan has been instrumental in supporting and empowering them to start new lives. But even as they dealt with serious issues personally and as a group, juggling the hats of homestay hosts, entrepreneurs, guides, activists and homemakers, there was never a day without laughter, playful teasing and gratitude for the lighter moments. The village gathers under the deodar tree to discuss the festival logistics. When the summer festivities began, I was amazed to see half the village in tadasana (tree pose) during the yoga workshop, joined them to cook pasta with wild oregano over an open fire, and bade goodbye to a massive turnout of runners on marathon day. The coolest mountain village in India? I think so. Cooking pasta in a handi on an open fire! Can’t get tired of that view of the mountains. Day 1 of the yoga workshop in Sarmoli! When I heard of the Wikipedia workshop, I had a crazy dream of leveraging Instagram to encourage the locals of Sarmoli to share their stories directly with the world. Turned out, it wasn’t so crazy after all. With a basic Instagram tutorial, followed by photography tips from a fellow traveller, the locals now run their own Instagram channel – @VoicesofMunsiari – documenting their lives, mountains, seasons and stories in their own voices. Everyone know that these are the peaks of panchchuli. When I was playing with my friends then my sister said that look at this view. The image of Panchchuli was reflecting on water filled roof. And I picked this photo. Photo by Alka. I expected the interest to die away gradually, but the account has not only grown in reach and engagement, it has also grown in storytelling and photography – despite access to only basic smartphones and English. One of their photos was even featured on Huffington Post India! So it’s time to take it to the next level. Currently, only a handful of locals have (basic) smartphones to take pictures and use the Instagram app. We are now crowd sourcing smartphones with good quality cameras, so we can get more locals on board this community channel and enable them to share snippets of their lives in the Himalayas too. If you, your family or friends have a spare phone or plan to upgrade to a new one, consider contributing it to this initiative? In return, mountain love on your Instagram feed is a promise. Email me at shivyanath@gmail.com if you’d like to contribute. Update (March 20th 2017): Thanks for your contributions and help with logistics so far! We have 7 smartphones pledged, and hope to meet our target of 10 soon. See below for updates on the Photography + Instagram workshop. A glimpse of everyday life in Sarmoli. Good news! Based on the response from you awesome folk, we will be conducting a 4 day Photography + Instagram workshop in and around Sarmoli, that will conclude in an Insta Walk on the late afternoon of 11th May. The workshop is open to all; please arrange your transport and accommodation at Sarmoli homestays directly. Drop me a note if you’d like to volunteer to help during the workshop; we could use all the hands and heads we can get. Our hunt for a smartphone photographer – who’d like to spend four days (or longer) in this gorgeous part of the mountains, sharing their art and skills with some budding local photographers – is still on. We’re looking for someone who is comfortable with Hindi and a wide range of smartphones. Please note that since this is an attempt to nurture a new generation of rural Himalayan storytellers, the photographer will need to cover his/her own transport and accommodation expenses. Good karma is on the cards, of course. Please send me an email at shivyanath@gmail.com with your portfolio or Instagram handle if you are interested. If the workshop goes well, the crazy dream is to organize a small photo exhibition, and use the funds to support a new outdoor education program in the village. Hopefully, it turns out to be a not-so-crazy dream after all. Our little project is now featured on Times of India, Conde Nast Traveller, Homegrown, The Better India and Business Insider! Any cool ideas on how we can further leverage Sarmoli’s photography & Instagram potential? Join me on Instagram, Facebook and Twitter for unique stories from my travels across India. Subscribe to my newsletter to receive travel inspiration in your inbox. OMG!! It’s so good to you posting again. I have missed you. Second I have to tell you how much I loved this. I loved this. It’s so beautiful and awesome. Thanks for sharing. The pictures are absolutely beautiful! Yes it was. Yeah and feel free to stop by my blog anytime to chat or just say hi. This is sweet! Giving voice to the people with the power of blogging. Loved every bit of it :). Hope to visit this place and meet the people their someday. Make it happen Avinash; I found a ton of inspiration there! This is brilliant! I love Malika’s idea of sharing the best of modern life with the villagers, while preserving what’s good in their own lives. And I love your pictures too! Thanks! We could use that philosophy in the cities too, but maybe it’s too late now. This is lovely! I would like to help on the ground later in the year. Would that be possible? I ask because I’m planning to spend 2-3 months in Uttarakhand starting July. I had no particular place in mind, but Sarmoli looks wonderful. The fact that they are trying to take their traditions along into modernity makes me feel like I’ll have a lot to learn from them! You can head there anyway, stay in a homestay (and hence support their work), and see what else you could get involved in! My two cents here. Don’t start in July, either start after the rainy season ends, or complete the 3 months before July. It gets really bad, and you don’t want to ruin your experience, do you? Very inspiring, especially the existence and effects of the sangathan! Thank you. It really was. I feel lucky to have been part of their lives for a little while! Beautiful pictures …lovely lifestyle. ◔‿◔ You are blessed with the good life! BRAVO! What a delightfully immersive glimpse into a hidden utopia. Love that you’ve found (and shared) this peaceful haven with us. Thank you and Namaste. Glad to be sharing it with so many supportive people! This just reminded me of my time at Pushpa di’s house this January. Beautifully written. 🙂 How about getting someone to build a website, too and make it an online store to sell their best work? I’m shocked myself but couldn’t be more happy that this village is paving way for the others. Love how everybody comes together and organises events and activities like the marathon. The people are full of talents and very skilful and I love how you made the point about the youngsters travelling to the city in search of work but they shouldn’t have to leave out of desperation or boredom. Still in the plannings but I think I’m gonna be travelling to Goa- India in April but it will be end of April/beginning of May. I would love to be a part of this. That’s awesome; we are hoping to do the photography+Instagram workshop in the 1st/2nd week of May. If you plan to visit Sarmoli around the same time, join us! I’ll try my best but if i cannot make it, i can always visit Sarmoli some other time. So nice to read. Thanks a lot. Wasn’t sure how to portray tehsil, so just went with district. And thanks for pointing out the peepal error – that was a deodar, silly me. Posts like these when I feel I have so much to see and experience in my own country and the list is ever growing! Great initiative Shivya! Makes me feel the same way Prachi! Inspiring Shivya. Needless to say, beautifully written article. I am more in awe of the villagers of Sarmoli and hopefully am able to visit them soon. I hope you are too Swati, we have so much to learn from them! great job indeed…truly empowering the people standing in last line in the lap of haven..would like to come for sure to them. Amazing information!! I am from Uttarakhand and I feel proud after reading this blog. Thanks for sharing this peaceful haven with us. Thanks for the post Shivya! The story of Pushpa is really inspiring and you have written it well. Though I haven’t been to Uttrakhand (will make it there one day) but do have some understanding of the challenges people face in hilly areas through my backpacking trip to Himachal, Sikkim and few others. Not to say that the photos are looking great as usual. How long did you stay in Sarmoli? Also, have you been to Kausani? Beautiful and serene village. You have captured superb photographs with a nice write up. I just love the mountains and keep reading posts related to Himalayas and mountains on many blogs. Would love to visit and stay in this place for few days :). Taking an inspiration from top travel bloggers from India like you, I have created my own website to share my travel experiences.It is just a small beginning related to my passion in travel & trekking. Such a wonderful place. I love this post and would like to thank you Shivya. I would like to visit this place. really nice…glad to know the unexplored is coming in the limelight. glad to read this article. Please keep writing such blogs for us. Beautiful article written, glad to read this article. The “PASTA” you made in handi in an open fire looks very delicious.Moreover, the pictures are very stunning. I wish to be there in my next trip! Hi , I was discussing marathons with a friend, over coffee , who mentioned this village. I’ve been wanting to run in some great location in each state and union territory. Previous PostHow to Score a Schengen Visa on an Indian Passport. Next PostFlying the World’s Most Modern Aircraft – Lufthansa A350.